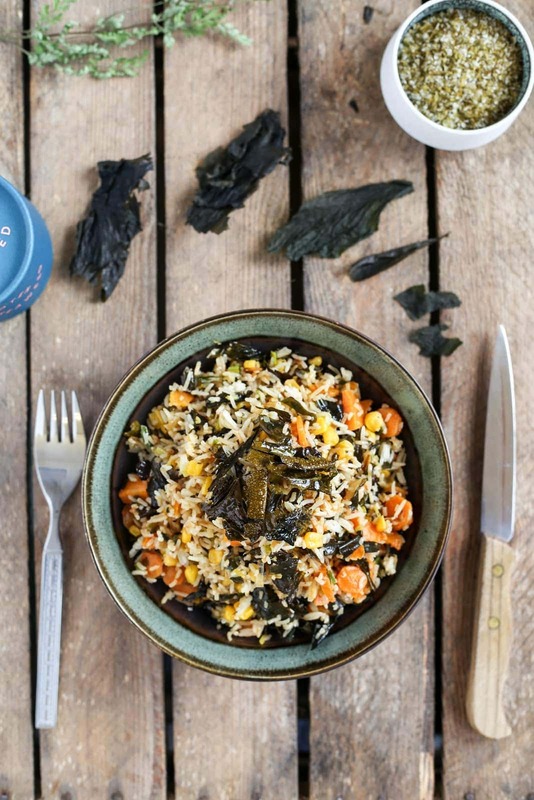 Winged Kelp Fried Rice - Lofoten Seaweed | From Lofoten, Weed Love. 1. Pre-cook rice and refrigerate overnight for best results. 2. Heat a large frying pan or wok with 1tbsp of oil to medium heat. Add leek and cook for 5 minutes or until soft. Add garlic and stir through well. Cook until aromatic. 3. Add carrot and corn, then bring the heat down to low. Let the vegetables fry, stirring occasionally so they do not stick to the bottom of the pan. 4. In a new frying pan heat remaining oil at a high heat. Wait for 5 minutes. To test if the oil is hot enough drop a small piece of dry winged kelp into the pan, the seaweed should bubble and begin to change color almost immediately. If so add the remaining winged kelp and stir so that all of the seaweed is coated in oil. The winged kelp pieces will shrink a little and turn golden brown. Only leave the seaweed in the pan for 10 – 15 seconds. Remove the winged kelp and transfer onto some paper towel. Pat down the winged kelp with the paper towel to remove excess oil. Let the winged kelp sit to cool. 5. Take your cooked rice and add it to the pan with leek and carrot. Stir until combined and add soy sauce, mirin and salt. Once all the rice mixture is coated add most of your fried winged kelp and stir through. 6. Serve with some fried winged kelp to garnish just before eating and enjoy!